Hello MC, Microsoft Scripting Guy Ed Wilson here. Next week, Nov 8-11, 2010, is the annual SQL PASS Summit in Seattle. In honor of this event, we will have guest bloggers from the SQL side of life. Today we will begin with Chad Miller. Chad Miller(Blog|Twitter) is a SQL Server DBA and Senior Manager of Database Administration at Raymond James Financial. In his spare time, he is the Project Coordinator/Developer of the Codeplex project SQL Server PowerShell Extensions (SQLPSX). Chad leads the Tampa Powershell User Group and is a frequent speaker at SQL Saturdays and Code Camps. We are data people and we believe data should exist in databases. We spend a good part of our day writing Transact-SQL scripts to query and load data from other sources. Therefore, not surprisingly when we use Windows PowerShell we want to run a command, capture the output and then store the data in a database. After the data is in a database, we can use Transact-SQL to do additional reporting and analysis. We might even use SQL Server Reporting Services to provide Web-based access to the data. 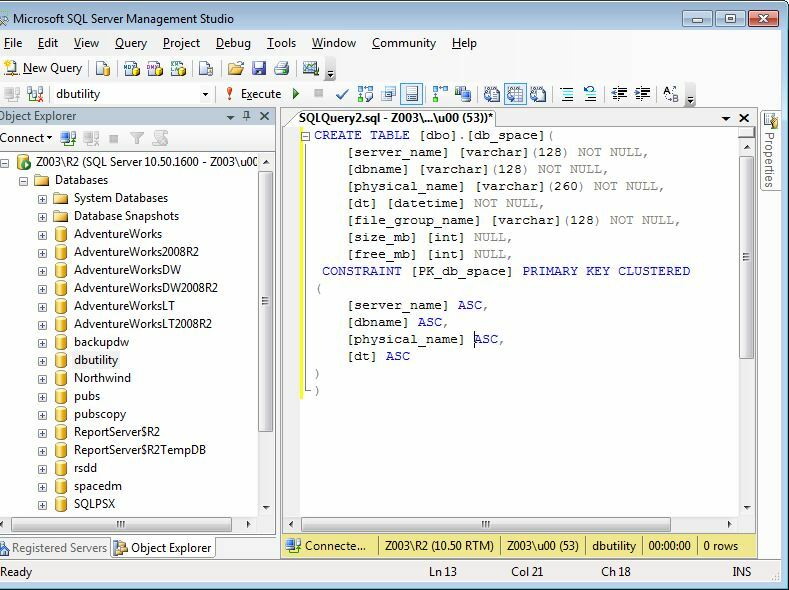 The following example dot sources the invoke-sqlcmd2.ps1 script that contains the invoke-sqlcmd2 function, connects to the pubs database on a SQL server named SQL1 and runs a basic Transact-SQL query. The last command is a single command, but has wrapped to the third line in the output. address : 10932 Bigge Rd. This example reads a file that contains T-SQL statements, runs the file, and writes the output to another file. This example uses the Windows PowerShell -Verbose parameter to return the message output of the PRINT command. When you have to run a Windows PowerShell command across multiple servers, you will frequently see examples in which the list of servers are stored in a text file and read by using the Get-Content cmdlet. However, most database professionals maintain a list of SQL Servers they manage in either a table they create or they may use Central Management Server (CMS) introduced in SQL Server 2008. Instead of using a text file, for database professionals, it makes more sense to read a SQL table. Let’s take a look at an example. For the purposes of this demonstration we’ll create a table. However, you could just as easily substitute the msdb.dbo.sysmanagement_shared_registered_servers view from your CMS server. From SQL Server Management Studio, create a SQL table. With our server_instance table populated, we can use our Invoke-SqlCmd2 function to retrieve a list of servers and then call Windows PowerShell command for each. The following example retrieves the version information. A common task for a database professional is collecting and loading data from multiple servers into central utility database. Using the invoke-sqlcmd2 function, we can extract data from a SQL Server data source, but to load data we have to introduce a new function called Write-DataTable. I have uploaded the Write-DataTable Windows PowerShell function to the Scripting Guys Script Repository. Save the Windows PowerShell function from the Script Repository as write-datatable.ps1 and then dot source our new function into the Windows PowerShell console by using the following command. The Write-DataTable function uses the .NET Data.SqlClient.SqlBulkCopy class to load an in-memory DataTable or DataRow array into a SQL Server table. This works out well because the cmdlet invoke-sqlcmd or our function invoke-sqlcmd2 returns a datatable object. Let us examine an example database named space usage collection for all databases in your environment to use in forecasting growth. The T script and management studio are seen in the following figure. Examining the type information about $dt variable we can see the type is of a DataTable as shown in the following figure. Using invoke-sqlcmd2 and piping the output to Out-GridView we can see the data has in fact been loaded. The results from this command are shown in the figure below. As we’ve seen, by using a couple of simple functions – invoke-sqlcmd2 and write-datatable – we can easily load data from any SQL Server data source, but what about any Windows PowerShell command? As an example, we want to collect disk space utilization by using Get-WMIObject Win32_LogicalDisk across a group of SQL Servers into a central database for reporting trending. If we can convert the output of our WMI call into a DataTable then we can use our Write-DataTable function. Using a function called Out-DataTable adapted from a script by Marc van Orsouw (Blog|Twitter) we can do just that. I saved the modified script to the Scripting Guys Script Repository. To load convert the output of a WMI call to a DataTable, we’ll pipe to our newly created out-datatable function and assign the output to a $dt. Having assigned the output to a datatable you can call the write-datatable to load the collected data into a SQL Server table. This makes out-datatable very powerful in that the output of any Windows PowerShell command can be easily loaded into a SQL Server table. Using write-datatable requires a SQL Server destination table to exist, but instead of manually creating a SQL Server table, we’ll use a new function called Add-SqlTable. The Add-SqlTable.ps1 script is also uploaded to the Scripting Guys Script Repository. Save the code as Add-SqlTable.ps1 and source the new function. Note: Using this technique to create a SQL Server table is not as precise as manually creating a table as certain elements including defining primary keys and data types are not handled. Add-SqlTable works best for a quick data dump of Windows PowerShell data to a SQL Server table. This post demonstrated how to query and load the output of any Windows PowerShell command into a SQL Server table. The functions invoke-sqlcmd2, write-datatable, out-datatable and add-sqltable can be used as building blocks for many of your Windows PowerShell-based data loading needs. MC, that is all there is to using Windows PowerShell and SQL Server. SQL week will continue tomorrow when SQL guest blogger Aaron Nelson will talk about how to work with SQL snap-ins. Thank you Chad, for sharing your time and knowledge with us.